FYI: This is the last post at http://teamsternation.blogspot.com/. The Teamster Nation Blog will continue at Teamster.org/news moving forward. Please make note of this for your bookmarks. All new blog content will be posted at Teamster.org/blog starting on Tuesday, January 19th. Thanks! - Communications Team, International Brotherhood of Teamsters. 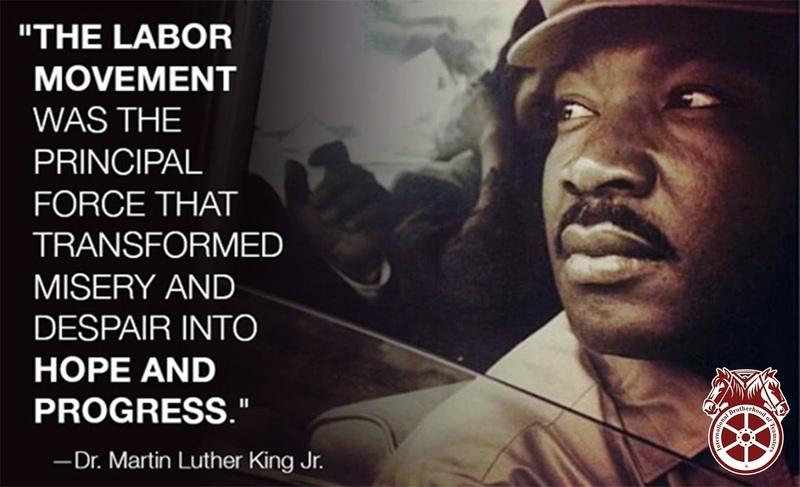 Teamster Nation is off in honor of Martin Luther King Day, celebrating Dr. King's unparalleled legacy of fighting for racial and economic justice. We will resume blogging tomorrow at our new home on www.Teamster.org/blog. Everyday Americans are facing a real battle keeping their heads above water financially. While unemployment continues to fall, incomes aren't rising for most workers. So it is particularly troublesome that the Supreme Court seems to be setting its sites on lowering incomes for thousands of public sector employees. On Monday, the nation's highest court heard arguments why several California public school teachers don't think they should have to pay reduced fees that cover collective bargaining costs of their contracts. Those fees, mind you, are not used for political donations. But no matter, their attorney said it's all political and violates the the First Amendment rights of plaintiffs in Friedrich v. California Teachers Association. Their burden of justification is much higher, because they can’t possibly show that abolition of the agency fees would lead to demise of unions. The huge political consequences of the case were unstated in the chamber, but the argument was at times as partisan as a debate on the House floor. Carvin frequently interrupted and talked over the three female justices — classic “mansplaining,” as Slate’s Dahlia Lithwick observed from the press seats. Carvin referred to the other side’s argument as the “so-called opposition” and pronounced Justice Sonia Sotomayor’s surname as “Soto-my-ear.” At one point he quipped that he has a First Amendment right not to join the American Bar Association, “because virtually every word out of their mouth I disagree with.” Justice Samuel Alito guffawed. The argument was mostly for show, because there was little doubt the 1977 Abood decision will go down. This will make it easier for public-sector workers who benefit from collective bargaining but who don’t want to be in unions to avoid paying fees to the union, even for nonpolitical functions. Union finances will be further drained at a time when labor is historically weak. Hard-working Americans deserve more than to be shunted to the side by this nation's government. But that is exactly what will happen if the high court rules with the plaintiffs in this case. Union membership will likely further decline, wages will fall and fewer and fewer workers will have access to quality health care and retirement benefits. A recent study showed that that a reduction in union membership was responsible for more than a third of the 7.6 percent decrease in the share of workers in the middle class between 1984 and 2014. That's what's at stake with this decision. The Teamsters and workers can't change the decision of the Supreme Court. But both can counteract any such a ruling by continuing to organize and pushing our lawmakers for policies that benefit workers. That why the Teamsters unveiled their "Let's Get America Working" platform last year and why it will continue to fight like hell to get it implemented. Never forget -- Teamsters Strong, America Stronger! 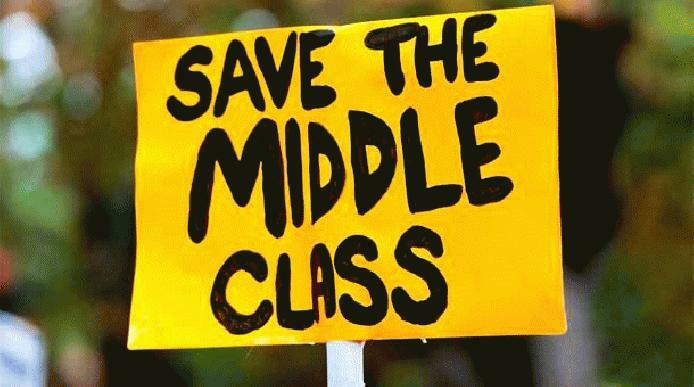 What Do Unions Do for the Middle Class? Center for American Progress ...The United States has long called itself a middle-class nation. But that statement is less true today than it was 30 years ago. Residents Of Flint Are Being Billed For Poisoned Water And Threatened With Shutoffs If They Don’t Pay Think Progress ...Last week Michigan Gov. Rick Snyder (R) declared a state of emergency over the level of lead being found in Flint’s tap water, and this week he activated the state National Guard to help provide residents with bottled water, filters, and lead testing kits. GST Ken Hall joins RTW protesters at rally last night. The following is the latest installment of what will be occasional dispatches from a Teamster on the ground about the battle to defeat so-called right-to-work (RTW) in West Virginia this year. They’re trying to fast-track it. It’s going to judiciary tomorrow. Ken is set to testify. 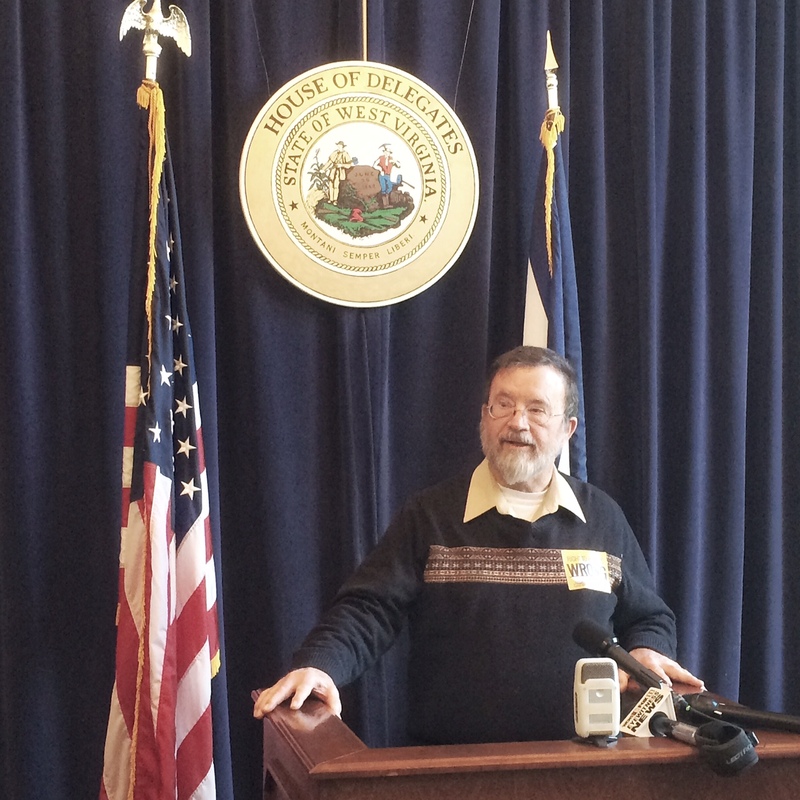 Teamsters General Secretary-Treasurer Ken Hall had been busy throughout the day, speaking with the press, lobbying state legislators and preparing for the action at the Statehouse before Gov. Earl Ray Tomblin’s State of the State address that evening. Workers had spent the week planning to crowd the rotunda, forming a gauntlet of protesters for legislators to have to walk through on their way to hear the governor’s address. A lot of these legislators don’t even understand what RTW is — they don’t know how it works … They call it workplace freedom — of course everyone wants workplace freedom. But that’s not what RTW really is. RTW is leaving a sour taste in the mouths of many workers. The latest battleground in the War on Workers was symbolic. If Mountaineer workers can defeat RTW again, it would be historic — and in a state with labor history as rich as West Virginia, where so many workers lost their lives on the job, and all too many still struggle to get by — it could mark a turning point for the entire labor movement. Today will be busy too. The Senate Judiciary Committee met this morning, where Hall testified in opposition of SB 1. The legislators have asked him to return at 3:00 p.m. for more questions. The press has been covering him throughout the day as he leads the fight for workers in West Virginia. DuluxGroup workers in Australia strike amid looming job cuts Sydney Morning Herald ...More than 100 staff at DuluxGroup have been barricaded from the paint maker's Brisbane factory after they voted to go on strike following the company's refusal to remove a cap on redundancy entitlements. The following is the first of what will be occasional dispatches from a Teamster on the ground about the battle to defeat so-called right-to-work (RTW) in West Virginia this year. CHARLESTON, W.Va. -- We arrived yesterday, greeted by a gusty snowfall on the way into Charleston — hopefully nothing compared to last year, where West Virginians braved the coldest winter in 20 years as they fought (and successfully defeated) state lawmakers' previous attempt to pass RTW here. Once again, Teamster Nation is on-the-scene to report from the Mountaineer State. Okla. union members spoke out against RTW today. and union members are ready for the fight of their working lives. They have long been aware that the future of their state hangs in the balance of pending RTW legislation, which, according to delegates, could be introduced in the Legislature as early as tonight, following Gov. Earl Ray Tomblin’s State of the State address. 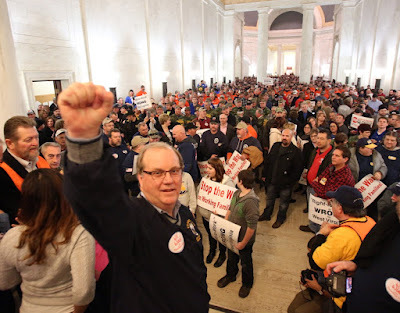 IBT General Secretary-Treasurer and Local 175 President Ken Hall has been leading the fight for months, appearing on television and writing op-eds to warn his fellow Mountaineers what is at stake. Today, he is set for a full day at the Statehouse. We’ve lost stable and gainful employment in my state. 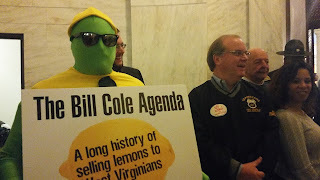 The so-called RTW law is an unnecessary government intrusion. Since passing in Oklahoma, too many unions are unable to negotiate contracts and thousands of jobs have been sent to Mexico. Right-to-work won’t create jobs. It is only an attack on unions, plain and simple, and union jobs that provide fair wages and benefits to workers. West Virginians deserve to hear the truth and they aren’t getting it from our Senate or House leadership and certainly not from the Chamber of Commerce.